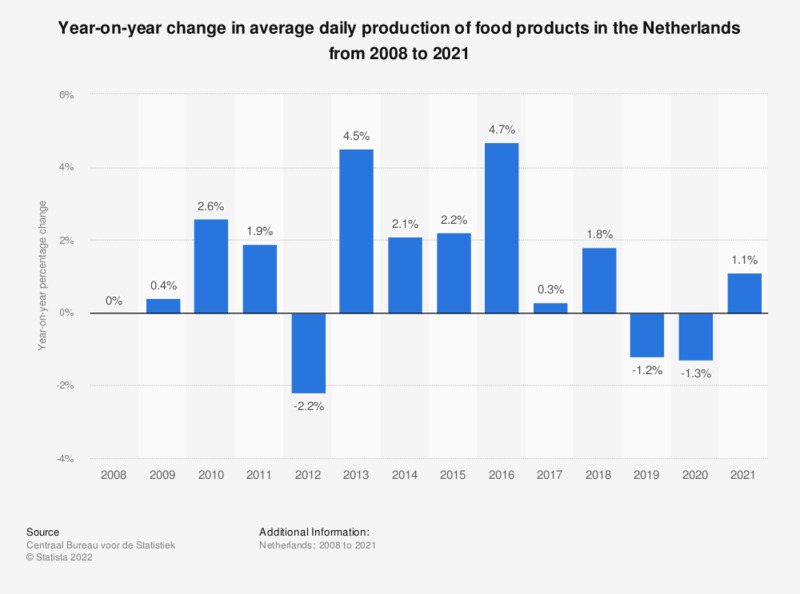 This statistic illustrates the percentage change in the average daily production of food products by manufacturers in the Netherlands from 2007 to 2017. Average daily production of food grew by 4.5 percent in 2013. In 2017, this was 0.9 percent. Production: "Production by industry is the volume change of gross value added at basic prices. Value added is defined as total production value minus total intermediate consumption value. Total intermediate consumption value includes the value of input in the production process in terms of goods and services to create the total output (production value) of a particular sector of industry." Average daily production: "The average daily production is calculated using a regression method. An adjustment is being made for changes in production because of national holidays, bridge days, working day effects, leap year effects, and shifting holiday patterns. This results in the average daily production, which is significant for the determination of development of production volume of a certain month in a particular year compared with the same month in the previous year." Everything On "Food market in the Netherlands" in One Document: Edited and Divided into Handy Chapters. Including Detailed References.